I just bumbled across the Browne Law Group while doing some competitive research in the greater Phoenix, AZ market. Sometimes I see work that I wish we had done, that I wish was mine so we could point at it and tell you…we’re awesome. And this is one of those sites. (But we didn’t, so I can’t.) Instead, I’m sharing this to try to inspire your mind to think beyond typical lawyer branding and positioning. And let me tell you, this might not work for you. Your lawyerly sensibilities may be completely insulted by law books turned into a dumbbell, or triceps that are bigger than your thighs. But you are totally wrong. The anti-lawyer lawyer branding speaks deeply to prospective clients when evaluating a lawyer. You either love him or hate him. And because of that, a prospect’s consideration set when selecting a counsel among the entire legal market gets split in two: the anti lawyer vs. everyone else who pretty much all look the same. For those of you who live under a rock, the legal profession suffers from an overall negative perception among the general populace. 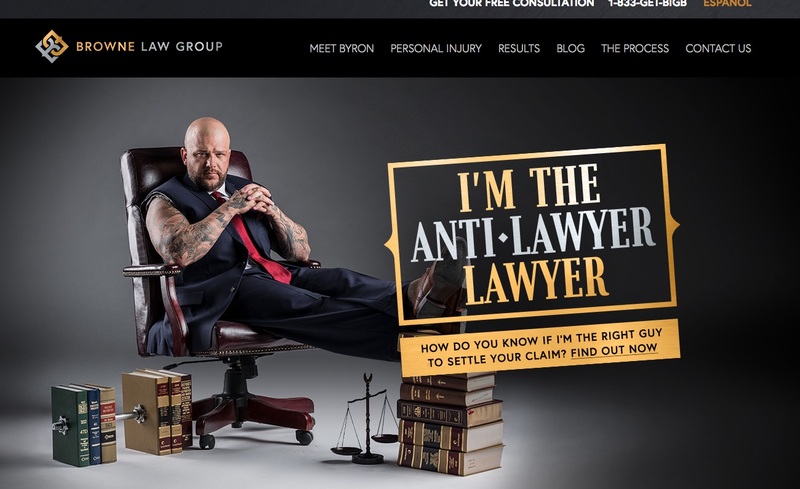 So, being the non-lawyer lawyer seems like positioning with extremely broad appeal. And as a side note – it’s more than just killer branding and content – the underlying code on the site is solid as well. It’s not our work, but I wish it was. Byron – when you stumble across this post, know that I wish you’d fire your agency and give us a call. But don’t. You don’t need to – they are really good. But to anyone else, who has the guts to pull some real genuine branding (with or without ink), give us a call. I wonder how many points he wins with judges and juries?